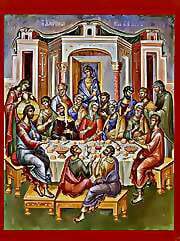 On April 1, 2001, a small group of orthodox faithful met to discuss forming a church in Martin County. On November 13, 2002, Bishop Alexios of Atlanta granted approval for a Greek Orthodox Mission to be established in Martin County to be known as the Mission of Saint John Chrysostom. Services were held in a storefront off of Gay Street in Stuart, Florida. On September 8, 2009, Bishop Alexios gave his permission for our parish to acquire our current property and buildings in Hobe Sound, Florida. The following month, the first services were held at our present location. On January 29, 2012, our priest, performed Divine Liturgy for the first time at St. John Chrysostom.